Shrimp is a great smoked food because the smoke brings out the natural flavors of the fish. Like most of our smoked shrimp recipes, there are actually two different ways to cook them. Some people prefer to purchase jumbo shrimp with the shell still on, and others prefer to smoke shrimp without the shell. If you are going for presentation right when this tasty appetizer comes off the smoker, we recommend removing the shell before you put the shrimp on. Otherwise, some people prefer to leave the shell on as it can protect the shrimp from becoming too smoky in flavor that can overwhelm some pallets. Either way, smoked shrimp kabobs are an easy recipe to make a before dinner treat. Season your shrimp with all of the ingredients: garlic, parsley, cayenne pepper, black pepper, and salt. Next, drizzle the extra virgin olive oil on top of the shrimp. Then skewer your shrimps on a kabob, going through each shrimp at the top and bottom. 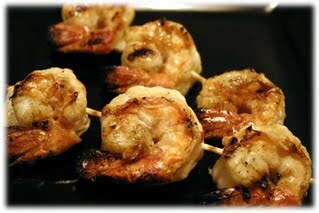 Place your shrimp kabobs on your smoker once it is heated to 225 degrees Fahrenheit. Place the wood chip foil pouch directly on your charcoal or inside your metal smoker box. The smoke will rise and flavor your shrimp throughout the smoking process. Smoke the shrimp for about 30-35 minutes or until your shrimp reaches an opaque white color. Smoked shrimp recipes have an extremely short cooking time. Some people eat shrimp raw, so the smoking process will lightly cook the shrimp and give it a great flavor. Your shrimp should only cook for about 30-35 minutes or it will begin to dry out on the smoker.